Hollybeary Creations : NND Feb. Release Day 3! NND Feb. Release Day 3! Happy Thursday everyone.. We hope you are enjoying the release so far! All the products will be available in the store tomorrow. 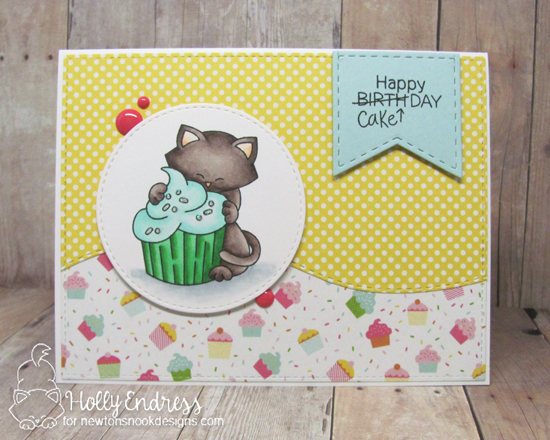 Today we are revealing the super cute Newton Loves Cake stamp and coordinating die set. I'm also using the new Land Borders Die we revealed on Tuesday. I started but created a White card base and then I added some pattern papers that I die cut with a Stitched Rectangle and the new Land Borders Die. I stamped the sentiment onto a die cut banner and added it to the upper corner. I stamped the Newton image onto a White circle that I die cut as well. I colored the image in with Copic markers. I adhered the circle onto the card with some foam tape and then I added some Clear Glittered Nuvo drops to the sprinkles and set it aside to dry. Once they were dry I also added some pink enamel dots. This is such a cute set full of great images perfect for every Birthday! Cuteness, love the patterned paper and design!! Sweet card! Love your coloring and the papers you used! 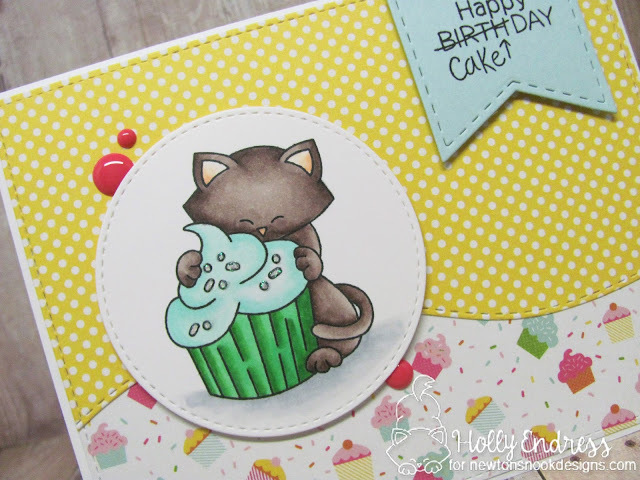 Great combination of cake-dsp and cake-cat-stamp! beautiful card! So sweet, your card!! I love Newton and the delicious cupcake! I love your use of pattern paper! Your coloring is perfect! Oh Holly! Your card is amazing! I love the colors too! Great card! This is so cute and sweet! Great use of pattern paper!!! Sweet card!! Love your coloring and your papers. Pretty coloring on this sweet card! 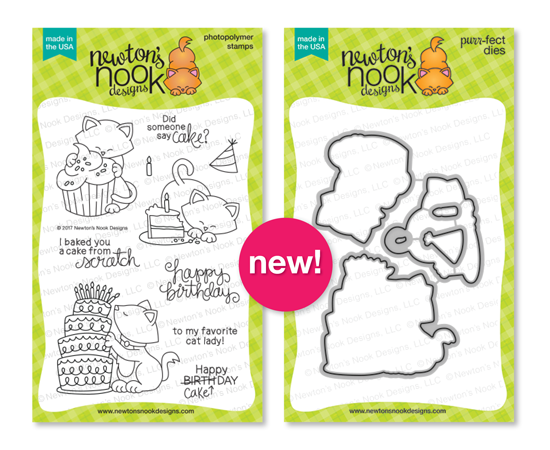 Love the bit of sparkle on the frosting and the cute Newton design! What a cute set! I love the kitten hugging the cupcake! Your sparkles add a great touch to the card. 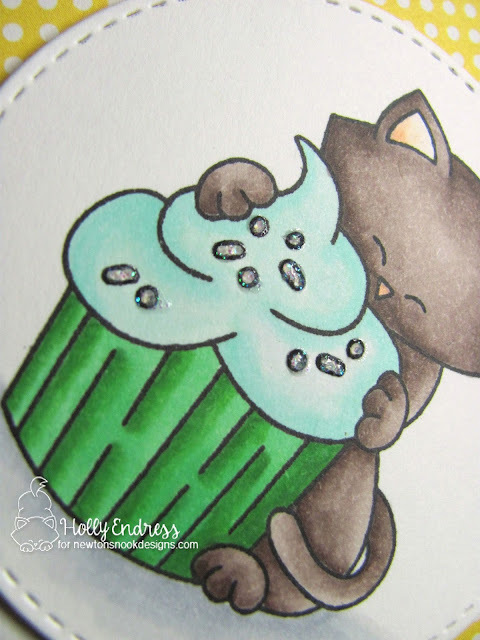 So cute--the cupcake paper is perfect. That is the cutest card! I love the color of the kitty - which markers did you use for him? I have a black cat but can't figure out a way to color one so it doesn't look like just a silhouette of a cat. Very cute card and love the colors. This is a cute card. Love the sentiment. What a beautiful card. Love your use of patterned paper. Adorable, this is a beautiful card and love this Newton so much!! Those sparkly sprinkles are a great way to finish off the card. Super sweet! Holly, I love your card, it is adorable!